I think the Boston Red Sox just got themselves a new theme song. 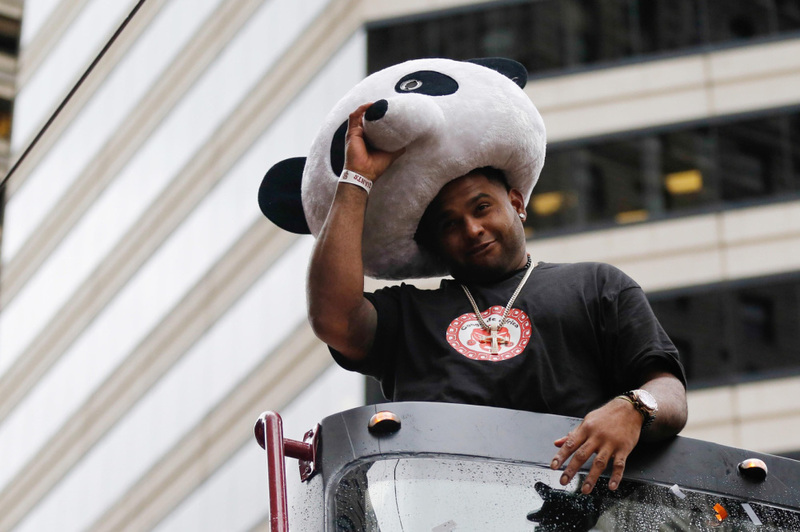 By now, the big contract signings of Pablo Sandoval and Hanley Ramirez are old news. Prior to Winter Meetings, the next big name on offseason docket for the Red Sox was Jon Lester. That didn’t work out for them. He picked the Cubs. What ensued next was a flurry of desperation moves to make up for losing out on getting their ace back. This next section will work best if you hit play on this video and try to read really really fast. Yoenis Cespedes, relief pitcher Alex Wilson, and pitching prospect Gabe Speier were traded to Detroit for Rick Porcello and a minor leaguer. When you combine this with the trade that the Sox wheeled with the Athletics in July, you come to realize the startling and hilarious fact that Boston essentially traded Jon Lester, Johnny Gomes, and a prospect for Rick Porcello, a pitcher who went 15-13 this past year on a Detroit team that scored the second most runs in the majors. Next, the team signed pitcher Justin Masterson to a one-year, $9.5 million contract. Masterson pitched a solid(ly career-worst) season in 2014 with a record of 7-9 and an ERA of 5.88 across two different teams on which he moved on and off the disabled list and in and out of the bullpen. Lastly, the Sox have a deal in place to send the fantastically named pitcher Rubby De La Rosa, the less interestingly-named pitcher Allen Webster , and a minor leaguer to Arizona in exchange for pitched Wade Miley. Miley is 38-35 in his career with an ERA 3.79. The team is now reportedly still looking to add a number one pitcher to serve as its ace. Phew. I listened to the song the entire time I was writing, and it was exhausting. These are a lot of questionable and high risk moves by the Red Sox in a very short span of time. With Yoenis Cespedes gone, it’s almost guaranteed that Hanley Ramirez will be taking his place in the outfield. Ramirez isn’t exactly the best fielder, and he definitely can’t do what Cespedes can. (I’ve watched that video so many times. To prove it’s not a fluke, here’s another.) He’ll move to the outfield, so things will be a bit different, but he’s still a defensive downgrade. Ramirez is also a huge injury liability. He’s had surgery three times, twice on his shoulder and once on his thumb. That, and the Boston bullpen put up fairly middling numbers last season. It’s an uphill climb in the division. Last season, the Orioles were tied for the second best record in the majors. They lost Nick Markakis and Nelson Cruz, but Buck Showalter showed how great a manager he is last season as he battled through injury after injury to major players (Wieters, Machado, Davis suspension), so I wouldn’t worry about them too much. The Blue Jays have been making noise this offseason with the signing of Russell Martin and the acquisition of Josh Donaldson from Oakland. They will be looking to build on last season. Boston finished dead last in 2014. But there’s still the wild card, right? Ehhh I suppose. Take a look at the other teams in the American League, though. The Detroit Tigers. The 2014 AL World Series losing Kansas City Royals. The up-and-coming Chicago White Sox. The league-leading Los Angeles Angels of Anaheim. The ever-improving Seattle Mariners. There’s a chance that Boston will make the playoffs in 2015, but it’s going to be tough. My prediction? I think the Sox will be on their couches watching the playoffs next October and we can all come back and remember these last 48 hours, listen to Yakety Sax, and realize just how much it applies. I’ve decided that I’m going to use this song as much as possible from here on out. Thank you, Boots Randolph. This entry was posted in General, MLB and tagged baseball, Boston Red Sox, Hanley Ramirez, Hot Stove, Jon Lester, Justin Masterson, MLB, Pablo Sandoval, Rick Porcello, Wade Miley, Winter Meetings, Yakety Sax, Yoenis Cespedes. Bookmark the permalink.